Amid the depressing news that the Deepwater Horizon oil spill in the Gulf of Mexico is still not contained nor getting better — over two week after the disaster started — there may be a little green ray of hope. The devastating effects of this oil rig spill could be the perfect moment to garner support for renewable energy. Last week President Obama announced that he was halting all future offshore drilling until this oily mess is figured out, but we think he should take that a step further. This oil spill is the perfect chance to educate the public about the devastating side effects of our dependency on oil and the clean future that renewable energy offers us as an alternative. Back in January President Obama used his State of the Union address to reach across party lines and involve everyone in the renewable energy movement by highlighting the positive effects it will have on our economy. The Deepwater Horizon oil spill is another perfect chance to use his presidential power to push for green. The negative effects of this mishap are apparent to everyone — even the drill baby Sarah Palin acknowledged them — but the positive effects of renewable energy aren’t widely apparent. So let’s connect these two story lines in a national discourse about our future. The first order of business for the White House should be containing and cleaning up the spill; the second order should be education. Solar panels and Wind Turbines won’t deliver oil soaked birds on our country’s beaches nor let dangerous toxins seep into our beautiful coastal estuaries. But, along with environmental arguments, financial arguments abound. This spill has already severely affected the Gulf Coast’s economic stability. Gulf Coast fisherman are out of jobs because of contaminated waters, the tourism industry expecting to suffer greatly, and the port of New Orleans could be shut down if and when the oil slick reaches its waters. We’re calling to the President to pull all of this information together and speak candidly to the US population. This is his chance to keep future disasters like the Deepwater Horizon spill from threatening the health of our environment and the livelihood of Americans. WHAT ABOUT GROWING HEMP FOR BIOMASS WHICH COULD BE USED FOR FUEL?? PEOPLE NEED TO INCLUDE HEMP IN THE DISCUSSIONS FOR ALTERNATIVE ENERGY, USING OUR SUN IS OUR BEST BET! President Obama holds a meeting with his administration about the Deepwater Horizon oil spill. Amid the depressing news that the Deepwater Horizon oil spill in the Gulf of Mexico is still not contained nor getting better -- over two week after the disaster started -- there may be a little green ray of hope. The devastating effects of this oil rig spill could be the perfect moment to garner support for renewable energy. Last week President Obama announced that he was halting all future offshore drilling until this oily mess is figured out, but we think he should take that a step further. This oil spill is the perfect chance to educate the public about the devastating side effects of our dependency on oil and the clean future that renewable energy offers us as an alternative. 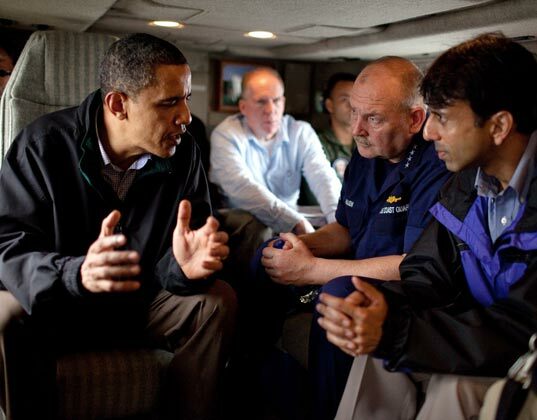 President Obama flew over the oil spill this weekend assessing the extent of the slick. 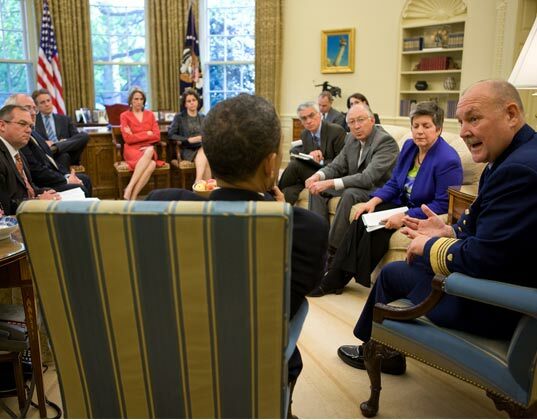 Janet Napolitano, the US Secretary of Homeland Security, briefs President Obama on the disaster.